A collection of articles from the past about important sports events. PASADENA - As the east claimed its fourth victory over the far west in intersectional gridiron warfare, the University of Ala­bama football team prepared for departure today with a 20 to 19 rose bowl victory over the University of Washington Huskies, champions of the Pacific coast in the New Year's day east-west game here yesterday as a souvenir of its visit to the coast. The game was the 11th since the first east-west contest here in 1916, and in it the south wrote for the first time the history of a victory by that section on a far western gridiron. Out of the south came the Crimson Tide to find itself at game time, outclassed in the betting, outweighed in line and backfield, to open in the third period, when all hopes of victory seemed gone, a brilliant array of passes, runs and bucks; to pierce the Husky line three times in rapid succession for touchdowns, which, aided by Buckler's conversions, gave the southerners a well deserved victory. To attempt to give the numerous reasons and point out the equally numerous stars all in one sentence borders on the im­possible. Instead, let it be simply stated that the Tuscaloosa Tide, after being swirled into a froth by the Purple Tornado, turned right around and swept the blustry gale right out to sea. It was Johnny Mack Brown and Pooley Hubert, and Grant Gillis and Emile Barnes and Bill Buckler and Capt. Bruce Jones and Tolbert Brown and Guy Enis and others of the stockingless Tide who did the sweeping. It was George Wilson, who was great in defeat. It was Louis Tesreau and George Buttormsen who were so unfortunate as to be the "goats." Pooley Hubert and Johnny Mack Brown are scheduled to go down in southern history along with Jeff Davis and Robert E. Lee. Pooley Hubert and Johnny Mack Brown buzzed by the Washington ends, through the Washington line, and passed over the Washington backs to probably the most sensational victory in the history of the Tournament of Roses. It was Johnny Mack Brown who seized two passes right out of the air over the out-generaled Louis Tesreau for two touchdowns, and it was Pooley Hubert who hurled himself against the Washington line for the other tally. It was Bill Buckler who twice converted the extra points, giving the Crimson Tide its victory. Alabama's win was a popular one. Not only in Birmingham and Tuscaloosa and Montgomery and Mobile, but right there in the Rose Bowl. George Wilson, Husky back, complained bitterly after the game. "The crowd beat us," he said. "We'll never play in Los Angeles again." Which is probably just as well for the Huskies. The Trojans are still waiting for the northerners to keep a return engagement in Los Angeles which they have continually eavaded. George Wilson, however, deserves all and any All-American honors he has received. The Huskies are a one-man team. With Wilson hurling himself into the Alabama bulwarks in the first and second quarters the Purple Tornado was clearly the best man on the field. But in the now-historic third quarter, with Wilson on the sidelines with injuries, the Crimson Tide passed and ran itself to a sterling victory. Three touchdowns, all scored through Louis Tesreau, who substituted for Wilson, spells the story of the victory. Crippled and battered, Wilson was rushed into the fray. Gamely he gave his best. It was enough for one touchdown, but Alabama had already won. Wilson was great in defeat, and the Alabama-crazy crowd which thronged the huge bowl paid him thunderous respect. Washington's ends were poor excuses. Alabama boasted a great pair of wingmen in Enis and Winslett. With brainy Pooley Hubert calling the plays, the Tide time after time swept around the ends for long gains. Hubert and Brown around the ends and through the tackles for from give yards to 25. Smart interference work was a feature of the Alabama attack. At times it crumpled, but for the most part was greatly effective. Hubert and Brown were so glorious that Barnes and Gillis were outshone. Yet this pair would be welcome on any team. Gillis booted the ball 50, 60, 70 yards. And his passing, although wild for the most part, will be talked about for generations to come. Brick Mueller was scheduled to give a passing exhibition between halves. He didn't apepar, and it was well he didn't. Brick's tosses would have appeared puny compared with the heaves of Gills. Fifty-nine yards he passed to Brown for Alabama's second touchdown! And Johnny Mack caught it over his shoulder on the dead run, taking the ball out of the air as it sailed like a bullet over Louis Tesreau. Knoxville, Tenn., Dec. 9.--The long-rumored break within the Southern Conference came tonight as 13 institutions offici­ally presented their resignations and announced the forma­tion of a new group to be known as the Southeastern con­ference. The teams who withdrew from the parent conference were Alabama, Auburn, Tennessee, Sewanee, Vanderbilt, Ken­tucky, Florida, Georgia, Georgia Tech, Louisiana State, Tulane university, Mississippi and Mississippi State. Dr. John J. Tigert, president of the University of Florida, spoke for the new group and presented the resignations of the other members at the annual banquet tonight. Dr. Frank L. McVey, president of the University of Kentuc­ky, was named president of the new conference. J. F. Broussard of Louisiana State university was elected vice­president and A. H. Armstrong of Georgia Tech, secretary. In his short talk in offering the resignations, Dr. Tigert said: "Since in our judgement the time has arrived for a more compact organization for the administration of athletics, it seems wise for a division of the Southern Conference to be made solely on geographic lines." He said the members of the Southeastern Conference would continue intercollegiate relations with the members of the Southern Conference and would at all times promote intimate and cordial contacts with members of the sister conference. In receiving the resignations, President C. P. Miles of the Southern Conference said "We regret you see fit to with­draw. I hope you may prosper and may your gates be big­ger and better." When the new group indicated at this afternoon's meeting they intended to offer their resignations tonight President Miles appointed a committee to confer with those leaving the conference and make a report tonight. A. W. Hobbs of North Carolina, chairman, said tonight his committee was of the opinion it was within the right of any group to withdraw whenever it felt it was to its benefit to do so and that there was no resentment against the others for pulling out of the conference. Speaking solely, he said, for himself, Hobbs told the confer­ence he was not deceived by any fine words that might be employed. "We are going to be two separate groups. You may talk about your accepting the same rules as we have but we are going to be two different conferences and you know it. There is no sentiment connected with this event. We have gone along together as far as we could and have come to a parting of the ways. The Southern Conference is at an end. I want to say there is nothing wrong with athletics and all we need is common honesty," he said. It was indicated tonight the remaining members of the con­ference would continue as a group with Virginia, Virginia Polytechnic Institute, Virginia Military Institute, Washing­ton and Lee, Maryland, North Carolina, Duke, North Caro­lina State, South Carolina and Clemson. Tonight's action brings an end to the long-recognized major Southern athletic body which included 23 institutions and stretched from Maryland to Louisiana. It was formed in 1921 and Dr. S. V. Sanford of Georgia, one of its founders, was a leader in the group which retired. It took the powers that be in the Southern conference a long time to make up their minds to split ... The reason the group wasn't divided sooner was because no satisfactory plan was presented. The split ... has its drawbacks, but they are only minor ones. The new Southeastern conference drew the cream of the Southern conference. But aside from Duke that should be good news to the ten schools remaining in the Southern conference. New York, May 10 - Asa Bushnell, commis­sioner of the Eastern College Athletic Con­ference, said Tuesday that if Southern col­leges drop the "purity" code, the NCAA will drop them. His threat was voiced in answer to reports that the South­ern, Southeastern and South­western conferences intend to disavow the "sanity" or "purity" athletic code in a meet­ing this month. "I haven't been informed officially that the Southerners in­tend to drop the code," said Bushnell. "But if they should do so, they would be barred from competing in all Nation­al Collegiate Athletic Association champion­ships in all sports." Asked what might happen in a sport such as football, which has no official national champ­ionships, Bushnell re­plied: "In general that would be up to the individual col­leges which wanted to play against the Southerners. But that would not apply to our Eastern Con­ference. None of our conference colleges would be permitted to play the Southerners - or anybody else defying the code - because we have a special rule by which our colleges have agreed not to meet colleges which do not live up to the same code." This would mean that Columbia, Cornell, Harvard, Yale, Princeton, Brown, Dart­mouth, Penn, Army and Navy would be barred from football competition with colleges disavowing the "purity" code. The hitch between the South and other parts of the country arises over the athletic finan­cial aid and recruiting points. rate any more than their brothers in the South. But they are forced to pay lip ser­vice to it. Off the record, most coaches will admit that subsidizing and recruiting of athletes goes on in all parts of the country. The South wants to pay the boys open and above board. Many "pure" colleges verbally dis­own such practices but have a blind eye for undercover payments. The only difference between paying a hard-running half­back openly and having an old grad slip him so much a week for expenses is a question of honesty. The South wants to do it honestly. THREE LOOPS SEEK APPROVAL OF "GRANTS"
Atlanta, May 10 - Athletic officials of the South­eastern and Southern Conferences in­dicated Tuesday night that they would ask the Southwestern Conference to join them in demanding that the National Intercollegiate Athletic Asso­ciation approve athletic scholar­ships. A meeting between the college presidents and the athletic directions of the three con­ferences, meanwhile, has been scheduled for May 28 in Atlanta. The calling of this meeting in itself is unusual. The South­eastern, Southern and Southwest­ern athletic authorities frequently hold con­ferences concerning their respective groups. A confab among the leaders of the three athletic conferences, however, is definitely out of the ordinary. 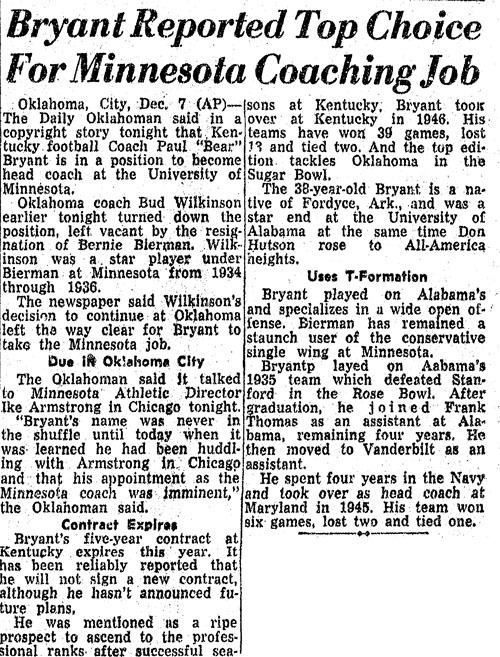 While doing research on Don Joyce for a book on the 1958 Baltimore Colts, I came across this Associated Press article from December 7, 1950, when Kentucky was preparing to play Oklahoma in the Sugar Bowl. Oh, how college football history might have changed! 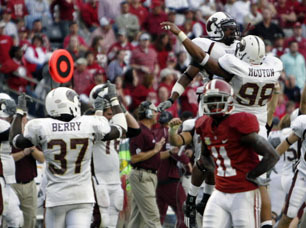 With Alabama entertaining Louisiana-Monroe today [9/26/15], it's appropriate to recall the last time ULM visited Tuscaloosa - 2007, Nick Saban's first year as Tide head coach. TUSCALOOSA - If last week's loss to Missi­ssippi State was the 2007 version of Nick Saban's loss to UAB during his first season at LSU, what does that make Saturday's 21-14 defeat to Louisiana-Monroe? Considering how late it was in the season, you might have to go back to 1982 to find an Alabama football loss this surprising and embarrassing. That was the year the Crim­son Tide lost 38-29 to an upstart Southern Miss team, spoiling Paul "Bear" Bryant's fi­nal home game and sending Alabama to the Liberty Bowl. At 6-5 (4-3 Southeastern Conference) and with next week's regular-season finale at Auburn still to be play­ed, the Crimson Tide might be hoping it can still reach a post­season game that prestigious. Alabama is one of 10 SEC teams that are bowl-eligible, and there might be only eight available slots if the league doesn't get two teams in the BCS. An Alabama team that has already lost three in a row - and might be in line for a fourth next week - wouldn't be an at­tractive invitee for even the various lower-tier bowls with SEC tie-ins. "We're not even worried about a bowl game right now," Alabama quarterback John Parker Wilson said. "We just need to figure some way to beat Auburn." 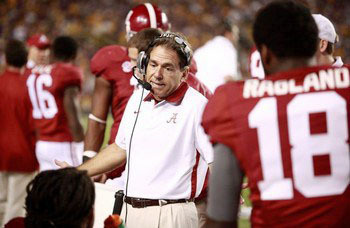 Alabama turned the ball over four times, in­cluding a pair of first-half interceptions thrown by Wilson. The second was returned all the way to the Alabama 1-yard line. The Crimson Tide did not force a turnover for the first time all year and allowed a num­ber of big plays on third-and-long. One of those proved to be the War­hawks' win­ning touchdown, an 11-yard pass from Kinsmon Lancaster to Marty Humphrey. Alabama drove the ball inside the ULM 20 three times in the second half, missing a field goal, fumbling and turning the ball over on downs. On the final series, Terry Grant was stopped on both third-and-1 and fourth-and-1 by a de­fense that ranked 82nd in the country in yards allowed. cluster of Alabama errors left the crowd at Bryant-Denny Stadium - which was at far less than capacity at kickoff and little more than half full by the end of the game - stunned, but not stunned enough to hold their disapproval. Boos rained down at sev­eral points during the game, perhaps for the first time all season at home. "I really can't blame them because we weren't playing up to par," said cornerback Simeon Castille, one of 22 seniors on the Alabama team. "Our fans do deserve better than that. They come out to support us and see us play good football and we weren't playing good football." It's hard to believe this team was once 6-2 and ranked No. 17 in the country after a 41-17 win against Tennessee on Oct. 20. Injuries to key players and the suspension of five others due to improprieties involving textbooks have been only part of the prob­lem. Saban's first LSU team in 2000 experienced its share of growing pains, most notably a 13-10 home loss to UAB in late September. But that team improved as the season went along, winning five of its final six games and beating Georgia Tech in the Peach Bowl. "We have not improved as a team since the Tennessee game," Saban said. "I think some of the things that have happened to our team since that time has affected our continuity, our ability to be consistent, it's affected our con­fidence and how we've played. That's not an excuse. That's a re­sponsibility we all need to take. This is not the kind of football we intend to be played here." This year's Alabama team hasn't played much differently from those under Mike Shu­la, who was fired one year ago next Sun­day. Alabama lost its third consecutive game on Saturday, marking the fourth time in five years the Crimson Tide has had at least one three-game losing streak. The loss also dropped Alabama to 3-13 in November since 2003, including 0-13 against everyone except Mississippi State (which has beaten Alabama the past two years). The Crimson Tide is 12-12 in all games since the beginning of the 2006 season. "I apologize to the people who support this program," Sa­ban said. "We didn't represent it with the class that it de­serves to be rep­resented with. And we will get it fixed." But probably not quickly enough to salvage this season.